Yamaha RX-A1080 review | What Hi-Fi? Though we try not to make assumptions before reviewing a product like the Yamaha RX-A1080, there are usually a number of safe bets when it comes to the company's premium AV receivers: the build will at least match its price tag; it’ll have a whopping great soundfield; and there will be more features than a Sunday newspaper. And if the RX-A1080 is representative of the rest of the company’s new range of Aventage products, those returns are sure to continue rolling in. A 7.2 channel amp, with a claimed 110W of power behind each and kitted out with an ESS SABRE ES9007S DAC, this model sits right in the middle of Yamaha’s five-strong suite for 2018, which spans mid-range to the comparatively high-end. 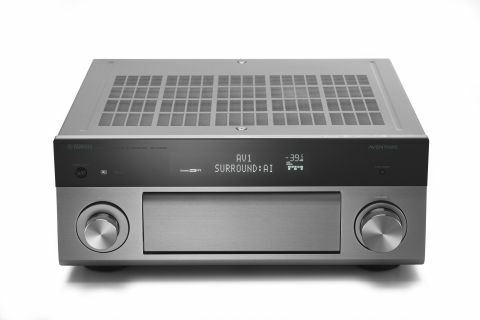 Rarely do we encounter an AV receiver anywhere short of robust, but Yamaha has focused on making this Aventage range as rigid and well-isolated as possible, including the addition of a fifth foot in the centre of the amp’s undercarriage to dampen vibrations from the power transformer and elsewhere in the unit. On the outside of the RX-A1080, you’ll find plenty of physical connections, including seven HDMI HDCP 2.2 inputs, compatible with 4K HDR and Dolby Vision content, alongside three comparably equipped HDMI outs. Yamaha has also accommodated for a second zone, meaning the RX-A1080 can also power and control a system elsewhere in the house, as well as the option of bi-amping. A phono input shows the company’s intention that this amp should be used for music playback as much as home cinema. The RX-A1080’s arsenal of features includes Yamaha’s YPAO RSC (Reflected Sound Control) technology, which measures the room and tailors speaker output from up to eight listening positions – giving an accurate gauge that requires only a touch of fine-tuning in our test room. Meanwhile, its Surround AI feature can optimise performance during a film, depending on aspects such as the scene, dialogue and soundtrack. We don’t usually go in for technologies such as the latter – if an amp is suitably talented, its focus is probably better directed toward transparency and letting the disc do the rest – but, here, the effect is restrained and a potential bonus for many users. The RX-A1080 is also a member of Yamaha’s MusicCast family, allowing for it to become part of a multi-room system. It can connect with the company’s MusicCast 20, MusicCast 50 and MusicCast Sub 100 wireless speakers as part of a 5.1 system that would require only front channels to be furnished with traditional home cinema speakers. Given the speakers you’d probably wish to pair with an amplifier of this stature, it may not be an ideal solution as far as performance is concerned, but does offer a versatile alternative to a full dedicated package. A more likely use of the RX-A1080, however, is Yamaha’s Virtual Speaker Technology, which uses its CINEMA DSP HD3 engine to simulate 11-channel sound on a 7-channel system. These things can only go so far in their replication of a wider configuration, of course – often you’re better off trying to extract the best from the speakers you have – however, this turns out to be a productive endeavour. And as well as its range of digital and analogue inputs for music sources, Yamaha has endowed the RX-A1080 with built-in streaming services such as Spotify, Tidal, Qobuz and Deezer, as well as providing support for the amp to be controlled by Alexa Voice Control. We’ve already touched upon the RX-A1080’s substantial soundfield, but it bears repeating. Yamaha has rarely been coy in this regard, and this latest Aventage amp is keen to embroil us in the action with a presentation that is both powerful and engagingly warm. The RX-A1080 feeds our reference PMC Twenty5.23 speaker package with the ingredients necessary to rumble its bass and soar in the high frequencies. It spreads its rich, full-bodied tone throughout the register, without rolling off any treble or ignoring the more abrasive sections of a film’s soundtrack. The performance is even and well rounded, offering the same character to an effect that switches across speakers, beginning behind our right shoulder and settling at the front left. It does, however, find itself a step behind the Denon range that leads the class in this area of the market for home cinema amplifiers and receivers. It isn’t that the RX-A1080 is lacking in detail, but more about its organisation, timing and dynamics. It is capable, but still some way from the best on offer. Even Denon’s AVR-X3500H, which undercuts this Yamaha by £400, is more expressive with its dialogue, offers greater punch and a more confident organisation of the impressive amount of sonic detail each has at its disposal. The contrast is perhaps most stark when listening to music, where the RX-A1080 is less rhythmically adept and struggles to match its main competitors’ levels of expression or entertainment. Those comparative deficiencies are the difference between four stars and five, but the RX-A1080 remains a good home cinema amp for the money. Although it loses out to its rivals in some important areas, its richness, body and breadth of its soundfield are difficult to match. Essentially, if you want your movies to sound huge, the Yamaha RX-A1080 should make it onto your shortlist.